The first and second days of November mark one of the most important cultural and religious festivals on Mexico’s events calendar: Day of the Dead, a festival that emphasizes remembrance of past lives and celebration of the continuity of life. Traditionally, November 1st honors deceased children and November 2nd honors deceased adults. 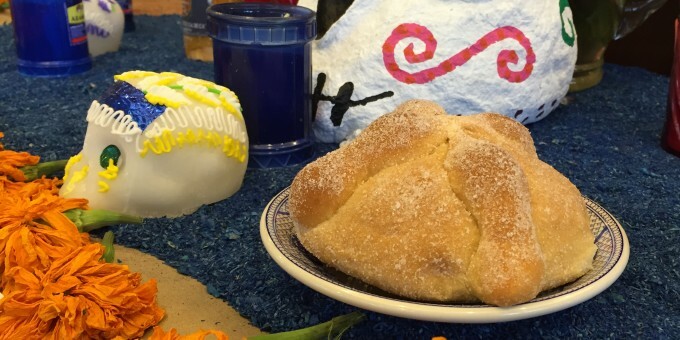 An important feature of the festivities is the creation of an ofrenda – an offering – that usually manifests as an altar in Catholic homes, featuring photographs of the remembered dead, accompanied by a number of traditional foods and decorations, including caramelized pumpkin, small sugar skulls, and orange marigold flowers called cempaxochitl, colloquially referred to as Flor de Muerto. Deborah now offers private consultations to new residency programs. Contact her for scheduling and pricing at 360xochiquetzal@gmail.com and make sure to write CONSULTATION in your subject line. My husband and I truly enjoyed our residency in Chapala, a place of beauty, extraordinary color, kind people – and inspiration! I was able to step back, concentrate, start working with new materials, relearn and incorporate new colors into my paintings on silk. Our casita was well placed and comfortable. Our host was welcoming and facilitated connections with other participating artists. Walking on the Malecon, discovering the town, attending cultural events, interacting with other residents from around the world – and watching in awe the extraordinary sunsets, this residency was a time of learning, relaxation and progress. I plan to return. I will always remember my writing residency in Chapala, where I spent a month making great headway on a collection of poetry I’d just begun focused on borders and walls—literal and metaphorical. Like so many Mexican towns, Chapala is simultaneously peaceful, bustling, and vibrant. The Xochi Quetzal casitas are located within walking distance to everything you need, and some are right across the street from the beautiful lake and lively boardwalk, where I went every evening to soak in this supremely alegre slice of Mexican life. The Upper Casita, with a view of the lake and surrounding mountains, was perfect for me, and the open terrace proved to be the ideal space for having other residents, who quickly became good friends, over for dinner or a glass of wine after a day’s work. Cobra and Christian are warm and welcoming, so from the beginning I felt at ease and at home. I highly recommend Xochi Quetzal if you are looking to immerse yourself in a creative project while balancing your work life with the stimulating and interesting exploration of a Mexican town. I hope to return again and again! We were new to Mexico and had no idea what to expect from the Residency or Chapala. Both were delightful! I was able to work successfully on two projects that have been germinating for some time, and also enjoy the friendly, lovely and accessible town with its many colors and flavors. Our casita was comfortable, spacious and nicely furnished. It included a studio, patio and a private balcony perfect for an end-of-day cocktail. Deborah, Christian and colleagues were the perfect hosts who fostered a very satisfying creative experience in an environment that was at once stimulating and restful. Muchisimas gracias! Our residency at 360 Xochi Quetzal was more than we had hoped for! The time and space to work, think, and explore–without deadlines or requirements–opened up our practice in a way we had not imagined. The town is lovely, easy to navigate, with everything within walking distance. The locals were so welcoming; we felt at home right away. Our accommodations in Lopez Cotilla were clean, comfortable and allowed both of us to have our own studio space. We really enjoyed quiet evenings on the patio watching the sun set over beautiful Chapala and meet ups with the other residents. Muchisimas gracias! After a beautiful and adventurous journey from Europe, we found ourselves in a taxi descending the hills of Sierra de San Juan Cosala with the full moon reflected in the lake. The word “magia and maravilla” crossed my mind and I got goose bumps. Chapala is indeed a magical place, colourful, charming and very safe with friendly people everywhere. We were blown away by the bird life, vegetation, architecture, which are so different from ours in Hungary. Our casita was a for us: comfortable, well-equipped and authentically Mexican. The Residency Handbook answered all our questions before we even asked them. Cobra and Christian are very attentive and kind, and their hospitality was unmatchable. As painting and writing residents during 2017, we both would like to thank you for the opportunity to be able to focus and collaborate on a project, entitled Immigrants. We had been thinking about it, had discussed it, but never quite got around to doing it until this residency. The atmosphere, encouragement, feedback and like-mindedness of all involved in Chapala gave us both the inspiration to move forward. It was a productive and great experience for us both and we thank you. I visited the 360 Xochi Quetzal Artist Residency in Chapala, Mexico for the entire month of April 2017. It was a perfect retreat for me. I loved watching the cowboys ride in on their horses. My work flourished, inspired by the other visiting artists and the tranquil nature of the town. I went to Ajijic and attended figure drawing and portrait sessions up to three times per week. I made new friends and felt encouraged in my writing and art making. I am so glad I had a chance to participate in this program. Chapala is a perfect place to get your work done with little distraction. 360 Xochi Quetzal was my first residency and I loved every bit of it. The opportunity to get away and single-task toward my writing instead of routinely multitasking was priceless. My studio was cute, clean, and well-equipped. Deborah and Sandra were very approachable, helpful, and I loved connecting with fellow-residents from different disciplines too. Most of all, the location of our residence across from the Malecón buzzing with artisans, vendors and restaurants offered to me just the right balance of isolation toward focused work and a community around. I hope to return soon. My time in Chapala was pivotal for me as a writer. You can’t understand the effect Chapala has until you arrive. Its splashes of color, rhythms and scenic beauty will inspire you. Scribbling away at Café Paris, locals ambling by, a cool glass of beer sweating on the table… I felt like Hemingway. This residency gave all that to me and more. It is a gift I continue to cherish; a feeling I look back on when in need of encouragement, inspiration, and motivation. Everyone comes to the residency for different reasons. For me it was a time to reflect upon this whirlwind past year. I lead a hectic life and often feel like I run from exhibition to exhibition without time for contemplation. I really needed to slow down and think about the next direction for my work. I got that and a lot more! I finished two small projects and reveled in the beautiful environment. I was able see the Monarch butterfly migration and experience an indigenous fiesta with my fellow artists. I left the residency refreshed, with new friends and purpose! My personal residency at 360 Xochi Quetzal was wonderfully productive and I would highly recommend it to anyone who has a creative project that requires some quiet, focused time. The casita was lovely – spacious, fully furnished, very clean and stocked. The residency hosts, Cobra and Christian, are welcoming, fun and engaging. My casita was steps away from the Malecón and within walking or bike riding to Ajijic. The locals are friendly and engaging-quick to suggest a favorite taco stand or even invite you to join them for a hike. I will definitely be back! The 360 Xochi Quetzel Personal Residency Program was a perfect place for me to focus on my children’s book. I wanted an authentic Mexico experience where I would be submersed in the culture and language. Chapala was easy to get around and affordable. The Lopez Cotilla casita was cool, breezy and comfortable. It had everything I needed. I woke up in the morning to hummingbirds buzzing around a tree outside my window. Sunsets were beautiful from the outdoor terrace and an occasional dramatic thunderstorm just to let you know who is really in charge around here. Muchas Gracias!! We have one word to describe the our experience here at 360 Xochi Quetzal, and that is MAGIC! The casita is very spacious, allowing for lots of room to create. It is very comfortable and clean, and has everything you could possibly need for your personal residency. We especially enjoy spending time on the relaxing balcony. Cobra and Chris are available and very helpful. The Residency Handbook in the casita addresses all of our questions in detail and offers suggestions for things to try around the area. You will often hear live music in the early evening from the Malecon. It feels very safe here, and even more secure having the Red Cross right across the street. It has been a wonderful experience, and Kristen and I would like to return each year. We have one word to describe the our experience here at 360 Xochi Quetzal, and that is MAGIC! The casita is very spacious, allowing for lots of room to create. It is very comfortable and clean, and has everything you could possibly need for your personal residency. We especially enjoy spending time on the relaxing balcony. Cobra and Chris are available and very helpful. The Residency Handbook in the casita addresses all of our questions in detail and offers suggestions for things to try around the area. You will often hear live music in the early evening from the Malecon. It feels very safe here, and even more secure having the Red Cross right across the street. It has been a wonderful experience, and Orion and I would like to return each year. Chapala is a safe, spiritually charged, beautiful place. Wild horses run through town. It’s a place where you greet strangers on the street. I walked along the lake in meditation a great deal. I hiked the looming cerro overlooking town. I biked all over the countryside. I wrote, documented, created composed soundscapes utilizing field recordings, and built small maquette light sculptures based on my experiences. I attended traditional temazcals, and sat alone in cathedrals. It was pivotal for me in a spiritual sense more than a career advancing experience. I’m very grateful for it, and Deborah Kruger is a wonderful advocate to keep in contact with. I truly recommend the residency. My residency at 360 Xochi Quetzal in summer 2015 was both restorative and productive. I was inspired by the beautiful studio and the surrounding Chapala / Jalisco region. The setting worked well for me in terms of inspiring and completing new work, and learning the history and customs of the area. The flexible residency requirements allowed an easy engagement with other residents, and encouraged me to participate in Chapala and Guadalajara communities. There are many contemporary art venues in Guadalajara, which are an easy bus ride from Chapala. Chapala has become my home away from home. The Xochi Quetztal residency is run efficiently. Cobra and her team are friendly, accessible, and professional. My stay in Chapala is enhanced by the personal relationships I have developed with several of the team members. The casita I stay in is very well maintained and fully equipped. The studio area is large and ready for me to engage in art as soon as I arrive. The weather is always fantastic. The lake, the town(s), the life, the restaurants, the view, the very friendly local people all call me back again and again. I love it!